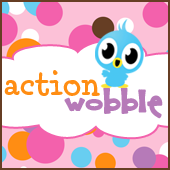 Melissa here from Moe Creations and It's my day here at the Action Wobble blog and I have such a cute, fun little card to share today, I don't remember why I got this SVG file, so I do apologize for that, but take a look at this little cutie, isn't she adorable? Oh my goodness I love this card. What a great idea to use the pumpkin for the 'O' in love. Way to think outside the box.